WeWorkA WeWork office in Paddington, west London. The cumulative take-up of flexible space operators has expanded rapidly to nearly 8 million square feet. Operators “have been accumulating a lot of space, they’re all in expansion, and … they’re not cycle-tested,” said CBRE’s Kevin McCauley. LONDON — The rapid take-up of office space by flexible operators is “something to beware of,” because its relative novelty means it not cycle-tested, according to Kevin McCauley, head of London research at commercial property firm CBRE. In practice, that means the business model flexible operators use — which typically involves signing a long-term lease on a building and sub-letting component parts of it on much shorter leases — could prove risky in a cyclical downturn, which many analysts believe is on the way in London. “Flexible workspace” might sound like a millenial-friendly buzz phrase, but it is fundamentally changing the make-up of office markets around the world. 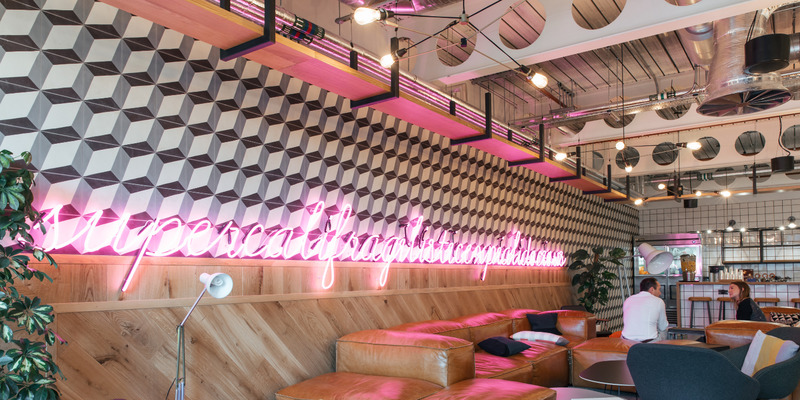 Most often associated with trendy brands like WeWork and The Office Group, co-working spaces have popped up in ever-increasing number since the financial crash of 2008, with start-ups drawn to the flexibility and low financial exposure of short-term leases. It shows that total take up of permanent leases of office space under 5,000 square feet (illustrated by the white line) has dropped off sharply, especially in the last twelve months. 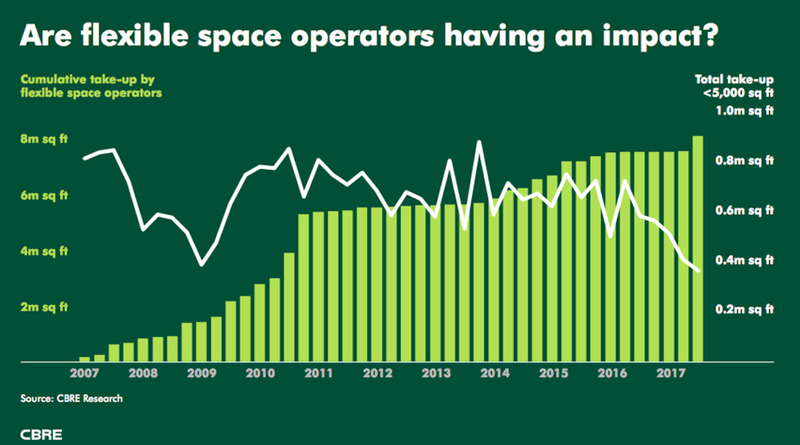 Meanwhile, the cumulative take-up of flexible space operators has expanded rapidly to nearly 8 million square feet, although operators have pulled back somewhat since 2016 in response to a slowdown in demand.